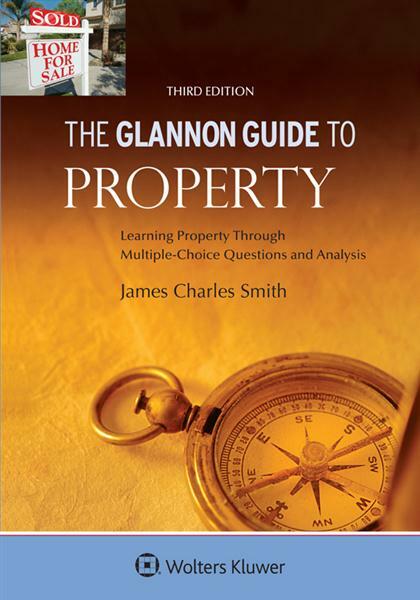 Following the established format of Aspen’s well-received Glannon Guide Series, Glannon Guide to Property: Learning Property Through Multiple-Choice Questions and Analysis, Third Edition, offers students a concise, clear, effective review of Property topics organized around the theme of multiple-choice questions. Brief explanatory text about the topic under discussion is followed by one or two multiple-choice questions. After each question, the author explains how the correct choice was chosen, providing the student not only with a review of the course content but also with tips on how to analyze exam questions. This book is also valuable for students to use when preparing for the real property part of the multistate bar exam. • Multiple-choice questions are integrated into a full-fledged review of the first-year Property course. • A concise introductory discussion of the law prepares students to learn effectively from subsequent questions. • Clear explanations of correct— and incorrect —answers help students clarify nuances in the law. • Multiple-choice questions hit the right balance— neither too difficult nor unrealistically straightforward. • A more challenging final question in each chapter (the “Closer”) illustrates a sophisticated problem in the area under discussion. • Updated “Closing Closer” questions in the last chapter provide practice and a focused review of concepts in earlier chapters. • All students, regardless of whether they will be tested by multiple-choice questions on their exams, will find this Glannon Guide to be an excellent exam review. • This Guide is a valuable bar examination tool for students to use when preparing for multiple-choice questions on the multistate bar exam. B. What Language Makes an Estate Defeasible? G. The Closer: Who Graduates from High School? B. Mortgage Theories: Does the Lender Have Title or a Lien?